JACKSON, Miss. – When Valentine’s Day starts creeping up, a whole lot of people in Jackson gravitate to an unassuming shop on the backside of a multi-store shopping center. Of course, they behave the same way when birthdays and anniversaries are around the corner – or on just any old day they have a craving for sweets. Emmie King is carrying on the chocolatier traditions of her mother, who created Nandy’s Candy in 1980; image by Tom Adkinson. Their target is Nandy’s Candy, a Mississippi institution since it opened in 1980. It’s not in some fancy collection of boutiques and jewelry stores. Instead, its neighbors include a Starbucks, an Oreck store, a Massage Envy, a sporting goods store and a Dollar Tree. Just as you shouldn’t judge a book by its cover, don’t judge a candy store by its neighbors. 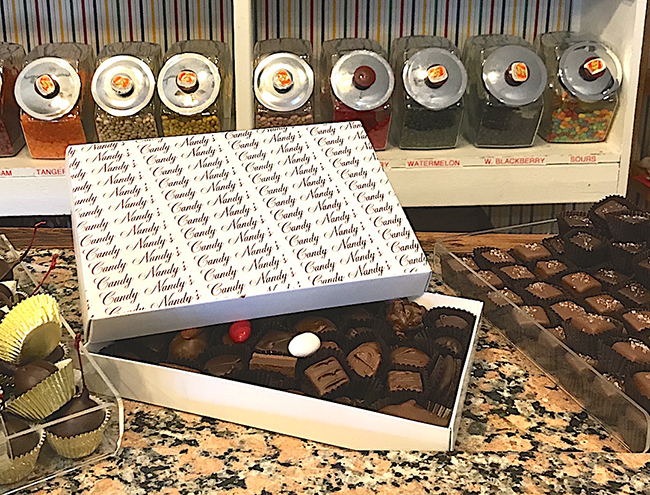 For four decades, Nandy’s Candy has been earning legions of fans for its carefully crafted chocolates and other confections you might not expect to be made in a medium-sized Southern city such as Jackson. This homegrown shop remains devoted to small-batch copper pot candy making, just as it has been since Nancy King went into business. The only major difference now is that Emmie King, Nancy’s daughter, is the chocolatier in charge. Emmie grew up in the candy business. 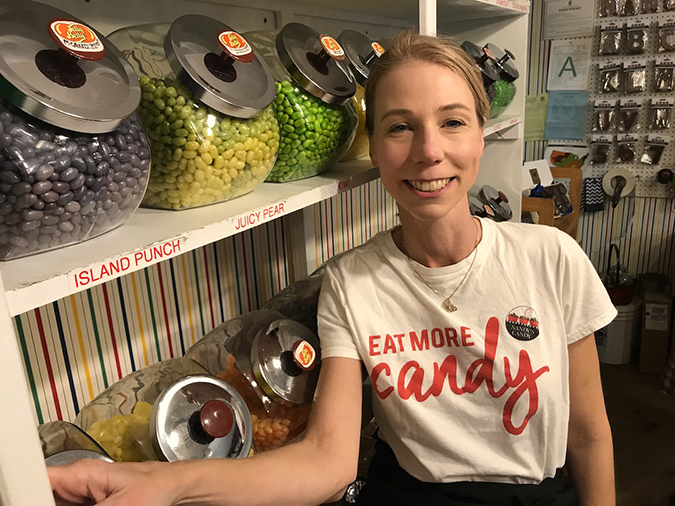 Her mother worked at a candy store before moving to Mississippi, and then when Nandy’s Candy opened, Emmie learned candy making at her mother’s elbow. Her son is her taster in chief. 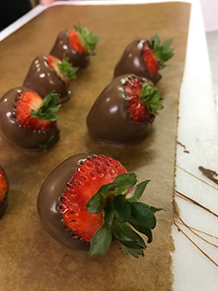 Nandy’s Candy is famous for its chocolate-covered strawberries – the freshest and best available. Image by Tom Adkinson. 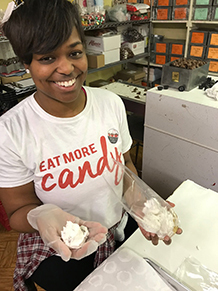 Divinity is just one of the 500 types of candy made at Nandy’s Candy over the course of a year. Image by Tom Adkinson. Keep telling yourself that nut-filled chocolate clusters are a good source of protein. Image by Tom Adkinson. The selection is impressive – up to 500 different kinds of candy during a year’s time of tasting. Truffles and fudge, snowballs in summer, pralines, divinity and more. All are made from scratch and without preservatives. The most popular item? Salted caramels. Chocolate-covered strawberries are a specialty, and Emmie has developed a reputation with the produce wholesaler who brings strawberries to Jackson. He knows that Emmie herself is the strawberry inspector and that there’s no use offering anything but the reddest, most perfect berries. A box from Nandy’s Candy is a favorite gift in Jackson, especially since the contents are made locally; image by Walton Fenelon. For patrons who want special souvenirs of a Mississippi visit, Nandy’s Candy offers several choices. 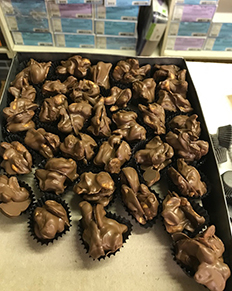 You can get bite-sized pieces of chocolate shaped like Mississippi, a Mississippi-shaped basket filled with Mississippi-shaped chocolates or a sugary praline crowned with a Mississippi-shaped chocolate. The shop is just off I-55 in Maywood Mart if you’re traveling through. If you’re not in Jackson, Nandy’s Candy is happy to ship your favorites straight to you. That’s how sweet Emmie King is.